This was entirely my experience. SUCH good food - maybe not healthy, but who asked for that anyway? Not Eastern Europe, Central Europe, but the rest is true. Hope you loved it here! 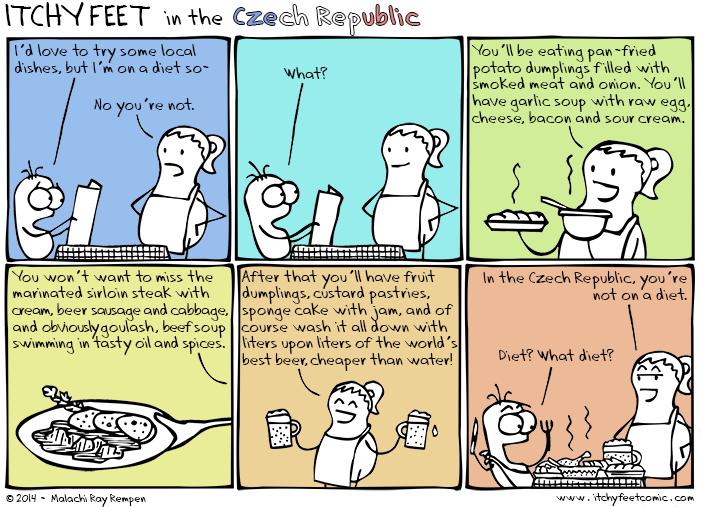 My experiences from Czechoslovakia and Czech republic are from so far back that the abundance of heavy food was not the problem but translation of the menus. I remember of having the most painfully hot pizza experience in Prague in 1997. Another anecdote comes from my then boyfriend. He had finished the dinner with his friends in a restaurant in Prague and wanted to order some dessert. They pointed an item in the menu to the server, and she shook her head ("No, no, you don't want to have that"), but they insisted. They ended up with a pile of potatoes---I don't remember if they were boiled or fried. Anyway, I've had an almost equivalent experience with Chinese menus. So true! But you forgot the fried cheese (available in a bun or as a whole meal)! Living here though, I've learned that the amount of walking/hiking/sports Czechs do (in the city, anyway), and fresher ingredients, evens things out, and I actually lose weight here. I call it the beer and fried cheese diet! I highly recommend it.